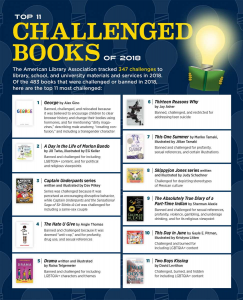 The American Library Association’s Office for Intellectual Freedom (ALA OIF) released their annual list of most frequently challenged and and banned books of 2018 and both Raina Telgemeier’s Drama, and This One Summer by Jillian and Mariko Tamaki are included in the Top 11. This is Drama’s fourth year as one of the most challenged and banned books, and the second appearance for This One Summer after it topped the list in 2016. This data is based on 347 challenges to materials in libraries, schools, and universities that were reported to ALA OIF. 483 books were challenged or banned in 2018. Once again this list is disproportionately filled with illustrated works, which make up more than half the titles. As for comics and graphic novels, which are over 18% of the list, comprise a relatively small percentage of the books available in school curriculum and libraries, public libraries, and other institutions, making their prominence on a list like this concerning. As a partner in the Kids’ Right to Read Project, CBLDF has worked to assist educators and librarians who faced challenges to many of the titles on this year’s list. Below we share this year’s Top 11. Beneath each title is the reason it was challenged, a brief description, and links to articles showing cases around the country. George knows in her heart she is a girl, but the world interacts with her as a boy. When her teacher announces they will be performing Charlotte’s Web as the school play, George knows that it is the best time to show her family and the world what she already knows in her heart. Marlon Bundo, the First Bunny of the United States, meets a handsome bespectacled bunny named Wesley, and they decide to get married. A local stink bug says they can’t get married because he’s in charge, and he believes being different is bad and wrong. Together with their friends, they’ll discover that they have the power to decide who’s in charge, and that being different is what makes everyone special. A beloved illustrated series focusing on two young boys who love making comics and pulling pranks, and their school principal who they’ve hypnotized into believing he is the superhero, Captain Underpants. Based on the Black Lives Matter movement, the coming of age novel focuses on 16 year old Starr Carter as she is drawn to activism following the police shooting of her childhood friend. When Callie’s love of theater doesn’t match her singing ability, she decides to join the tech department. A charming graphic novel about the trials and tribulations of relationships and theater in middle school. Clay Jensen returns home to find a package from Hannah, a classmate who killed herself. Inside are cassette tapes Hannah recorded explaining there are 13 reasons why she took her own life, and Clay is one of them. She promises if he listens all the way through he’ll understand why. A coming of age graphic novel that won both a Printz and a Caldecott Honor Award for its beautiful illustrations and moving story. Centered on Rose, an ordinary teenage girl, whose summer trip with her family to the beach is strange and and different from the years previous, not because of anything external, but because the age at which she is and the feelings she’s processing. SKippyjon Jones is a Siamese cat with overly large ears. Since he doesn’t look like his mom-cat or his dad-cat, he assumes he must be a chihuahua. The story of a young boy growing up on the Spokane Indian Reservation who wants to be a cartoonist so he leaves his school on the Rez to attend an all-white farm town high school where the only other Indian is the mascot. Based on the authors own life. An exuberant reflection of the LGBTQIA community, this picture book examines Pride in an accessible way. Also includes a reading guide with interesting LGBTQIA facts, and ideas for how to talk to with children about sexual orientation. Two 17 year old boys attempt to break the Guinness World Record for kissing. While the potential for this book to be silly fluff seems strong, the way that other gay teens dealing with coming out, gay hook-up sites, gender identity, and more, find themselves reflected in the marathon kissing session adds depth and reality to the series, The Greek Chorus narration by the generation of men lost to AIDS, grounds the work in both a historical reality not often taught in schools, and magical realism that creates an air of the ethereal. Stay tuned throughout the week for more information and programs celebrating intellectual freedom and free expression since it is National Library Week! Use the hashtag #NationalLibraryWeek to read or talk about events and articles celebrating this American institution, and as always keep following CBLDF on Twitter and Instagram, or like us on Facebook to stay up to date with challenges and bans around the country.